• The Arc of Greensboro is committed to identifying and securing lifelong opportunities for children and adults with intellectual and developmental disabilities, promoting and protecting their human rights, and actively supporting their inclusion and participation in the community throughout their lifetimes. Members working with this group will help with document shredding, organizing, and cleaning their storage room. • WhiteStone a community that provides seniors with a fresh view of senior living. Members working with this group will assist with cleaning the basement, general cleaning, and painting rocking chairs. • Guilford Education Alliance promotes quality public education for all students, with an emphasis on GCS, and a guiding philosophy that success of students is the responsibility of the whole community. Members working with this group will assist with sorting school supplies, restocking the shopping area, and various cleaning projects. • The Humane Society of the Piedmont is dedicated to reducing pet-overpopulation, providing assistance to pet owners in need, and reducing unnecessary euthanasia in local shelters. Members working with this group will help with stocking their new food pantry shed. • StepUp Greensboro empowers disadvantaged adults living in Guilford County with training, active mentoring and support services that help them find and keep jobs, and build stable lives. Members working with this group will assist in the office and clothing area. • Habitat Humanity Restore is a home improvement and donation center that sells new and gently used furniture, appliances, home accessories, building materials, and more to the public. Proceeds from their sales are used to help build strength, stability, self-reliance, and shelter in local communities and around the world. Members working with this group will help with various tasks within the restore. • Earlier.org’s objective is to identify a biological test for the earlier detection of breast cancer which has the potential to reduce or prevent invasive surgery, minimize treatment, and dramatically increase survival rates. Earlier.org works to direct as many funds as possible, as quickly as possible, to breast cancer research. Members working with this group will help assemble gift bags for the Sherlock 5k dog walk, an event benefiting Earlier.org. 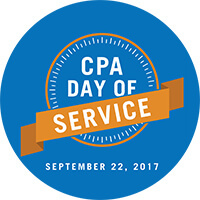 Now in its fourth year, NCACPA’s Day of Service continues to successfully serve North Carolina communities financially and socially. DMJ supports the NCACPA through professional membership and has many leaders who serve on NCACPA board of directors, task forces, and committees. Serving the community is important to DMJ. Throughout the year, DMJ professionals serve and volunteer through committees, nonprofit board involvement, and donate personal time to local organizations. Whether it is a food or supply drive, a holiday giving program, or “polar plunging” for Special Olympics, DMJ is privileged to be involved and give back to the community. Follow our work on social media using #CPAService or #DMJinAction. Founded in 1919, the North Carolina Association of CPAs has provided exceptional member service for the past 96 years and is the only statewide association for CPAs in North Carolina. Now serving more than 14,000 members in North Carolina, the association is dedicated to observing changes within the profession and ensuring that their members have the resources they need. For more information please visit our website at www.ncacpa.org.